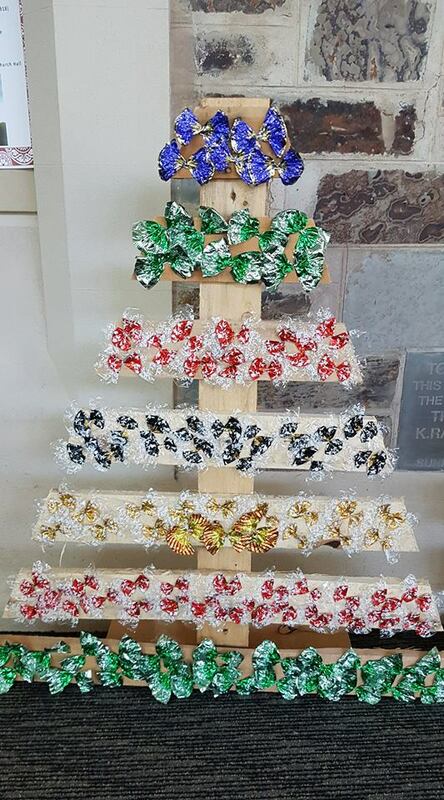 Have you ever wondered how your Roses or Lindt chocolate wrappers were used to decorate a Christmas Tree? Here's an example of their use. There are more examples of their use through out the Christmas Tree festival. Even though there was a power black out along Jetty Road and the wind blew ferociously and it rained, we had power at St Peter’s Church and the Christmas tree festival was opened. Around 60 people enjoyed a glass of sparking wine and a finger food, before Father Andrew opened the festival. It was wonderful to see so many people milling around the community centre looking at the trading table and talking up their Christmas trees and wreaths. When it was almost time to turn on the Christmas tree lights, everyone moved from the community centre, stood by their tree ready to turn on their Christmas tree lights. Father Andrew said a blessing over the festival and all who visit, followed by a count down before the lights were switched on. ← The Christmas Tree Festival is almost here!